It's that time of year again -- time for recital photos! - Please, make sure that your dancer's hair and make up is done prior to coming to the studio. - Make sure you check with your teacher to see what hairstyles, color of tights and lipstick should be worn with each outfit. - The inside of all costumes should be labeled with the dancer's name. - We ask for you patience on this day. The photographer and Ms. Diane are working hard to get your dancer looking their best in every picture. - Photo purchase information will be available at the recital and during 2018-2019 enrollment days in mid-August. Please be at the studio 15 minutes before your picture time. The photographer can’t wait, so please be on time. Bring water and non-messy snacks. No siblings, please (one parent per dancer). It gets very crowded in the studio. Please be patient and kind. Every dancer of every act will be photographed individually as well as with their group, and Ms. Diane makes sure they look amazing. Picture Day can run behind schedule, and can also catch up, so don’t count on coming late. But also try not to schedule anything within 2 hours after your time. If you're worried about time, please contact a parent (who may have dancers with an earlier call time) a few hours before your scheduled time to see what the schedule looks like, but still plan on being 1⁄2 hour early. Once the older girls start getting photographed, the schedule will catch up. Costumes: Be sure to bring all the costumes, accessories and shoes for each routine your dancer will be performing at Recital. Makeup: Blush, brown eyeshadow, white eyeshadow, black mascara, black liquid eyeliner, pink lipstick or red lipstick depending on the routine (please check with your instructor on which lipstick color your dancer will be wearing). Also, please make sure there is NO nail polish on their nails. A very neutral color may be okay, but please, check with Ms. Diane to be sure. For older grades, black false eyelashes. Younger children, please, try and apply a little mascara. 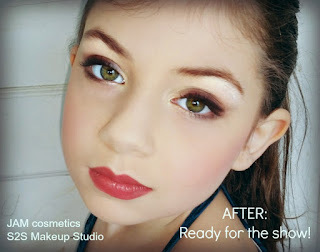 I found a post on s2makeupstudio with some very helpful hints for recital makeup. I know some of you may not want any makeup on your dancer, but keep in mind the harshness/wash out effect of stage lights. Also, here's an excellent post on the reasons for stage makeup including: lights, sweating, bright costumes, distance between dancer and audience. This should ease your concerns. Hair: neatly slicked back into bun with a hair net (this requirement may be changed by their teacher and is dependent on the number the dancer is in). No bangs or flyaways. Boys, please check with your teacher on hair style requirement. No jewelry: This means no earrings, watches, necklaces, etc. Ballet/Jazz/Tap shoes: Clean and free of marks! Tights: No holes and clean, please. Studio tights are available for purchase at the Ballet Boutique (please, check hours in the sidebar to make sure it's staffed before you arrive).